It's the early days of the Qing Dynasty, and the Ming General Chen Chang Kung has fled to Taiwan with a price on his head. Top fighter Shung Ching Kwei works for a Qing field marshal, but when a disagreement results in him beheading his own boss, he heads for Taiwan to join Kung's army in exile, pursued by hand picked warriors of Qing lord To Ko Lan. On his road to escape Kwei encounters Keigi, a beautiful woman of Japanese descent who is living by her wits (stripping off during gambling matches to distract the other players, for example), and northern kickboxing champion Sun Hsin, who pops up every now and again to aid Kwei when things get too tough. But Kwei's biggest battle will prove to be with To Ko Tan himself, a fighter of formidable and dangerous skill who is determined to bring Kwei down. Honestly, do you really care about these plot details? If you're a kung fu film fan then you'll already know that the prime purpose of most genre narratives is not to wax lyrical on the politics of Chinese history or the human condition, but to establish who the good and bad guys are and get them into fights. If you're new to this film then you'll only want to know one thing: are those fights any good? Well the short answer is yes. The long answer is bloody hell yes. Wong Tao and John Liu play Shung Ching Kwei and Sun Hsin respectively, re-united after their co-starring role in James Nam and See-Yuen Ng's 1976 Secret Rivals [Nan quan bei tui] and here at the top of their game. This is old school kung fu at close to its best, the fight choreography and martial arts skills of its stars making for some superb and sometimes lengthy fight sequences, including impressive woodland and riverside battles with two swordsman, and a climactic three-way duel in which Kwei and Hsin join forces in an attempt to defeat the mighty To Ko Lan, who is played by Eagle Han Ying, a fighter of considerable skill who represents a credible challenge for the two. John Liu tends to come off best on screen, in part because of his consistently cheery demeanour (Kwei takes himself way too seriously and clearly needs to loosen up a bit), but also because the northern kickboxing style is so visually impressive, especially as demonstrated by Liu, who can execute a string of impressive kicks without lowering his leg or dropping his grin once. It's also he who suffers least from the sometimes hilarious English voice dub, which reaches an almost parodic peak with the scroll-waving messenger, where an attempt to match the mouth movements of the original Mandarin dialogue results in lines growled out in the fractured monotone of a malfunctioning robot on the verge of complete mechanical failure. On top of that, the score seems to have been lifted entirely from other movies, most recognisably the main theme from Ennio Morricone's score for Hang 'Em High. But if you can tolerate this and the toilet paper-thin storyline – and if you're a martial arts cinema fan of some years standing then you'll be on familiar turf here – then Death Duel of Kung Fu definitely deserves your attention. The fights are very well staged, the pace is breezy and director Sum Cheung knows well how to stay out of the way of his performers and best showcase their talents. The shocking state of the transfer on The 55th Chamber's release of My Kung Fu 12 Kicks left them with nowhere to go but up, and although the print here takes a step in that direction, it's a depressingly small one. Mind you, this very transfer has already made an appearance on UK DVD a few years back at the hands of DVD.com, making this effectively a re-release. The opportunity to right the original wrong has thus been sadly missed. It's not all bad. The colours sometimes are OK and the detail is occasionally rather good, and unlike 12 Kicks the picture is actually widescreen. Well, when I say widescreen I mean 16:9, which would all be well and fine if the correct aspect ratio were not 2.35:1, which we are given a frustrating taster of in the pre-title sequence. A bigger problem is the state of the original print, which is plastered with dust and scratches and even the odd gob of splicing glue, with most of the reel changes announced by a dance of dirt and sudden jumps on the soundtrack. The contrast and sharpness are wildly variable and things completely nose-dive at the end when the picture rolls up and is eaten alive by dust. The fact that it is not anamorphically enhanced and appears to have been converted from an NTSC original just emphasises the problems. The soundtrack is similarly schizophrenic. Horrible voice acting aside, the dialogue, sound effects, music and underlying hiss are intermittently muffled for five minutes at a time, making it sound as if your speakers have been shoved into a large and hairy sock. The Death Duel of Kung Fu UK Promotional Trailer (0:56) is basic stuff and follows the trend set by the film by opening at 2.35:1 and then switching to 16:9. Other Exciting Releases and Web Links are self-promotional and of no real interest. 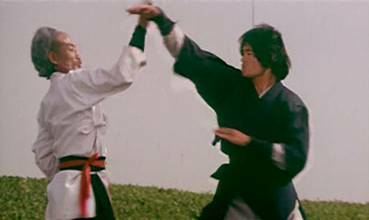 As someone who grew up with and still cherishes the pleasures of old school kung fu films, Death Duel of Kung Fu is a minor nostalgic treat, a series of splendidly choreographed and performed fights strung together by a plot I had to consult my notes to even remember. It deserves to be lovingly restored and given a Bey Logan commentary, but instead we get a re-issue of the same cropped, non-anamorphic, astonishingly messy print from the previous release, with a soundtrack to match. Not bloody fair.